SYSTEM DESCRIPTION: Easy to apply, SELF LEVELING grade pre-mixed single component, liquid, cold applied waterproofing membrane. 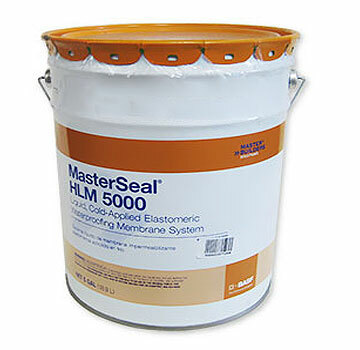 MasterSeal HLM 5000 is a moisture-curing, bitumen-modified polyurethane elastomeric waterproofing membrane for exterior below-grade or between-slab applications. Elastomeric system designed to expand and contract with normal structural movements. APPLICATIONS: HLM 5000® SELF LEVELING grade is a one-component, moisture-curing, bitumen-modified polyurethane elastomeric waterproofing membrane for exterior below-grade or between-slab applications. Used for both vertical and horizontal applications. Product can be applied over Green Concrete (see data sheet). Use together with protection board in below-grade walls. Limitations: Its not designed for negative side waterproofing (interior) or a pond/pool inside liner. Do not use under tile OUTSIDE. It has a low melting point. Cure: Appreciable properties develop within 24 – 48 hours at 75° F (24° C) and 50% relative humidity. Yield: 25 – 30 ft2/gallon at 55 – 65 wet mils (0.61 – 0.74 m2/L at 1.4 – 1.7 mm wet. This is FINISHED thickness. Apply in TWO coats, each coat at 50 square feet per gallon / 30 mils per coat. MasterSeal 975 Drain Board (DBS 6200) 4x50 ft.